WCW World Heavyweight Champion Hulk Hogan’s huge signing to World Championship Wrestling in June earlier in the year was a sign that perhaps things would change. To an extent, that was correct. Hogan’s arrival brought more money and sponsorships to WCW and his creative pull allowed him to bring in various faces of his past and recreate some magic. Still, for every feud he had with Ric Flair, there was a Butcher match in the wings. If you told us that he’d be the main event of the biggest show of the year instead of doing the “Loser Must Retire” match there, we would’ve laughed too. Star power doesn’t always provide a star product. That’s evident up and down through this card, though the quick wits of Bobby “The Brain” Heenan on commentary make it easier to sit through. WCW tried to pass off “What’s Old Is New Again,” but alas, we just feel like it was done better somewhere else before. – The opening video dove through all the card matchups with your classic 1990’s-styled rectangular graphics with a voiceover narrator that actually sounded a bit like the World Wrestling Federation’s Vince McMahon. It was also apparent that we were in Music City, also known as Nashville, Tennessee. Yee-Haw. – Santa Claus was shown in the crowd, apparently with nothing to do two days after Christmas Day. To emphasize the grandiose occurrence before us, they showed the presentation of the National Anthem. It would’ve worked had it not been an average country music singer. He sort of looked like Johnny B. Badd. We’re on a conspiracy theory here of some sort. – A theme of the night here would be various cuts to the previous night’s Awards Ceremony held by Pro Wrestling Illustrated, as they presented Awards of different categories to WCW talent. Of course, first on this list was Hogan as he received the 1994 Pro Wrestler Of The Year Award. He credited the fans in his speech for getting him back in the ring and the retirement of Flair as his biggest accomplishment to date. Right. We still wonder if all the PWI Awards that year were just given to WCW? – The WCW United States Heavyweight Championship match between Vader and Champion “Hacksaw” Jim Duggan sounded right on paper and Heenan slapped it with a “Bad Blood Feud” vibe. To paint that masterpiece further, they grappled on the ramp for a little. Vader even took a bump on the safety railing with his damn chest. His mask came off afterwards, a little too nonchalantly. Is he the only wrestler who doesn’t even struggle to keep his mask on? Duggan landed a body slam that got a decent pop. Vader followed up with a missed moonsault. Harley Race was a constant presence at ringside and cost Duggan several chances at a pinfall, especially as he distracted the Referee when Duggan hit a powerslam. Duggan was shoved into a board held by Race, as Vader hit some kind of eh spinning sit-down buster to get the win and become new Champion. Off with a shocker. – Backstage, The Three Faces Of Fear (that’s Avlanache, Kevin Sullivan and Butcher, mind you) were interviewed by “Mean” Gene Okerlund. The highlight here was Butcher’s grasp on a custom-made tombstone that read, “Hulkamania Rest In Agony,” while Sullivan stood there and made “burial” gestures. Guess he made burying cool before anybody else. Avalanche got over his eagerness to finally have Sting one-on-one to himself. Sullivan alluded to an alliance “made in Tennessee” and that somebody was paid as a backup plan. Avalanche did some loud screaming to finish this scene. That was a lot to take in. – The Jean Paul Levesque (yes, Triple H in a besmirched Frenchman gimmick not far from Hunter Hearst Helmsley)-“Das Wunderkind” Alex Wright match was exactly what it sounded like – two formidable rookies. Wright was hyped as being the youngest wrestler from Germany at 18 and was the clear babyface. He did a nice backflip off the top rope and broke out his signature dance. He also leap-frogged the Referee while Levesque cowered in the corner. They actually predicted on commentary that Wright would one day be a World Title contender. What day is that again? Levesque kicked out of a submission and went with an array of closed fist colossus. Things mulled along for a few more minutes. Strangely enough, it wasn’t terrible. Wright rolled back to pin Levesque as he built his campaign further. – The WCW World Television Championship match between Arn Anderson and Champion Badd saw some blunders, as Anderson’s picture stopped midway through. They mentioned that Honky Tonk Man was nowhere to be found, probably a low-key shot at him for walking out on the company earlier in the day upon learning he’d lose the match. Anderson was a good replacement, all things considering. Badd was very over, no worries there. Meng stood outside in a black suit and shades and looked like a badass Samoan hitman. Not a bad match as Anderson bent the rules when he could as Badd powered him down with athleticism. In the end, he rolled him up with a school boy pin and retained. – They cut to The Nasty Boys as they received the PWI 1994 Tag Team Of The Year Award. They were grateful? Okay, they were loud. Nah, just nasty. It’s their names, get it? – The NB-Harlem Heat match had some manly entrances, that was for sure. How could you not rock along to NB’s cheesy entrance theme? Though it oddly sounded like the melody of The Smashing Pumpkins’ “I Am One,” but that’s an obscure nit-pick. The big (by chance) story here was that it was just a grudge match of sorts. They couldn’t acknowledge that HH had won the Tag Titles just prior to the show because it didn’t actually air yet, so no references to gold were made here. Brain dropped another hilarious line – “What do you call a woman with two million dollars? Divorced!” Bam. We’re dead. After some high-impact double-team maneuvers by NB, the action took to the outside. They did the double-arm DDT spot twice on Booker T. They targeted the arms, an apparent game plan, which went against NB’s usual fighting ways. Stevie Ray botched an inverted suplex onto the railing by the entranceway. Jerry Sags did a wicked clothesline on Booker and a minute later, broke out a double DDT “out of sheer luck.” The Referee threw the match out as Sister Sherri’s interference attempts severely backfired as she took to the top rope and accidentally landed on one of her boys. This set her up to receive what we’ll call “The Pit Stop” which involves an arm pit. Yup. NB were awarded the match by disqualification. Don’t worry, this program would outdo itself a few months later at Uncensored 1995. Read that here. – They cut to Sting as he received the PWI 1994 Most Popular Wrestler Of The Year Award. Prompted in a black leather jacket and his face paint, he described how excited he was. Flash back to current day (the next day that is, this is 1994, fool) and he was backstage with Okerlund to hype his match with Avalanche. The theme here was that he addressed ‘Ol Avy’s criticism that he always looked to the “Stingers” for help and he indeed embraced the fact. He called himself a “Giant Killer.” Well then. – The Sullivan-Mr. T match was a “Score-Settling Affair” as Mr. T’s first time in a WCW ring as a wrestler. For some reason, he wore a Referee outfit. To Heenan’s keen observation, he did look like a zebra with a beard. Santa Claus also appeared and gave out t-shirts to the ringside fans, though his walk resembled Cactus Jack more than anyone else. This match happened for no apparent reason, other than maybe cheap publicity by way of T’s association with Hogan forever determined by WrestleMania I. This bout become known more for the clumsy cameraman than the ring work. T then tried to pin the cameraman. Why? We don’t know. What is this? “Mouth Of The South” Jimmy Hart came down and Santa was eventually revealed as Dave Sullivan, Kevin’s brother. In a taste of megaphone karma, Kevin got whacked with the holiday bag and T grabbed the pin. Garbage. Post-match, Kevin attacked his brother and gave Santa a piledriver. Now we’re just imagining a bad Christmas movie where the Three Faces Of Fear try to take down Christmas at the North Pole. Don’t tell anyone you got it from us. – Okerlund stood backstage with Hogan/Hart as he addressed the Butcher match and “Macho Man” Randy Savage’s earlier comments leading to the show. Here’s some cheap background. The big hook for the main event was what Savage would do at the end of the match. He claimed he’d either shake Hogan’s hand or slap him. Either one of those two things would happen. He will or he won’t. Yup. Your hook. This was your typical Hogan “YA KNOW SOMETHIN’ MEAN GENE” promo. He did sprinkle in the term “personal differences” to describe his relationship with Macho Man to appease the “smart fans” we guess. Hart described how everyone had jumped onto the Hogan bandwagon and he always had his back from day one, or something like that. Hogan was amped up. It’s weird though. He was the babyface, but was saying things that made you think twice. – The Sting-Avalanche match began as they dueled poses and shoved each other. Bit of a slow pace with a lot of yelling by the Referee at Avalanche for attacking Sting in the corner. Some more back-and-forth. Sting made a big comeback, but when he hit the Stinger splash in the corner, he didn’t know the Referee was behind Avalanche and thus, we had a Ref bump moment. He body slammed him to a big pop and applied the Scorpion Death Lock. Sullivan came inside and things got physical. Avalanche hit a splash on Sting. Hogan came out to a pop as the heels retreated. The bell rang as Sting was announced winner by DQ. Another similar finish to the NB-HH match. – They cut to Hart winning the PWI 1994 Manager Of The Year Award and subsequent speech, which echoed what he said in Hogan’s backstage segment. Afterwards, they ran through all of the events that revolved around Butcher’s allegiance to Hogan and subsequent betrayal when he was revealed as one of the masked men that were a thorn in Hogan’s side. 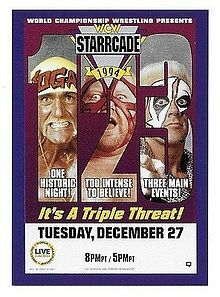 Decent stuff, but again, this is Starrcade. Still feels like a lackluster main event. – The WCW World Heavyweight Championship match between Butcher and Hogan began to take off once Hart grabbed a chair away from Butcher. Hogan then used said chair on Butcher a few times, while the Referee looked on. Let the record show that two previous matches on the card were called DQ’s and a chair’s apparently fine here in the main event. More back and forth before Butcher got in offense by way of rest holds and an exuberant sleeper. Before the sleeper, the fans stood up and looked towards the stage, but it was nothing of consequence. Hogan rose from the dead at three and “Hulked” up. Sullivan/Avalanche (who jogged) ran down to the ring, before Hogan was able to hit the big leg drop to get the three before they even touched him. Well, that’s anticlimactic as hell. Fear not though, here came Savage. What would he do? He teased an alignment with FOF as he pointed towards Hogan but upon the charge, he attacked the heels instead. He/Hogan fought them off and it was another Mega Powers reunion as they shook hands and posed for a few minutes. Meh. – Backstage, Gene addressed the finish and claimed it was a banner year for Hulkamania. All six months. The good guys of the locker room were all there too. Savage mentioned his broken promise to FOF and feigned an apology. The vibe was celebratory until Vader/Race crashed the scene. With that, he claimed Hogan was scared for the first time in his career and officially called him out. Hogan responded with a fierce shove and it became a melee. Guess we’ve got our next Hogan feud. There’s that at least. Was that Security Guard Gerald Brisco? Posted on October 22, 2017, in Throwback PPVs and tagged "Hacksaw" Jim Duggan, Alex Wright, Arn Anderson, Avalanche, Bill Apter, Bobby Heenan, Colonel Rob Parker, Dave Sullivan, Harlem Heat, Harley Race, Hulk Hogan, Jean Paul Levesque, Jimmy Hart, Johnny B. Badd, Kevin Sullivan, Mean Gene Okerlund, Meng, Mr. T, Pro Wrestling Illustrated, Randy Savage, Santa Claus, Sister Sherri, Starrcade, Sting, The Butcher, The Faces Of Fear, The Nasty Boys, Tony Schiavone, Vader, WCW. Bookmark the permalink. Leave a comment.